Stephen King is as mad as his infamous evil clown over the Maine governor's claim that he doesn't pay his state taxes. 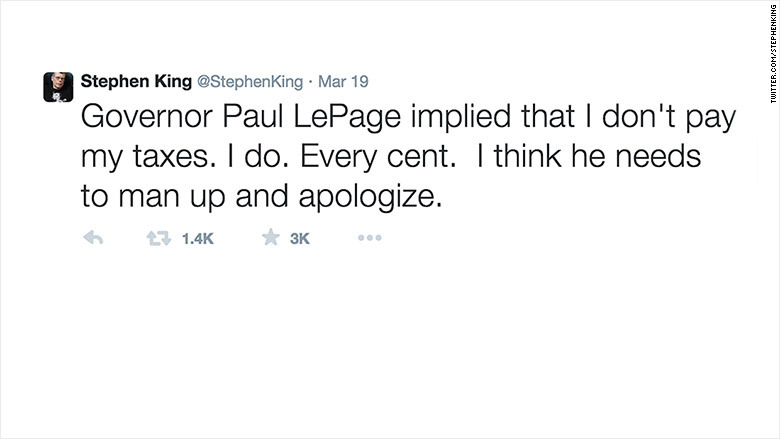 "Governor Paul LePage implied that I don't pay my taxes," King tweeted. "I do. Every cent. I think he needs to man up and apologize." King made that statement on March 19. The governor had just called him out in his weekly radio broadcast for fleeing the state to avoid income taxes, according to the Portland Press Herald. According to the Portland Press Herald's screen shot of the original transcript from the governor's web site, he says that King "moved away" from Maine, along with Burt's Bees co-founder Roxanne Quimby and former Gov. Ken Curtis, who "lives in Florida where there is no income tax." On Monday morning, however, the transcript on the governor's site didn't contain any references to King. Stephen King wants an apology from Maine's governor, who said that he left the state to avoid taxes. King is the bestselling author of 55 books, including "It," a horror novel with a scary clown. 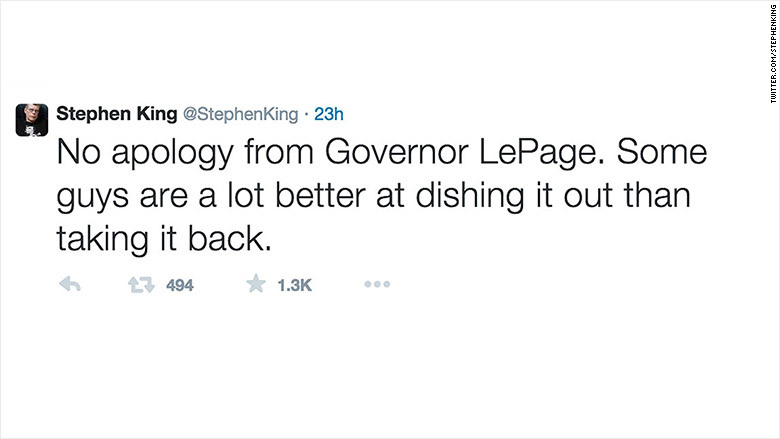 "No apology from Governor LePage," tweeted King on Sunday. "Some guys are a lot better at dishing it out than taking it back." The governor's office did not immediately return messages from CNNMoney. King is a native of Maine. He was born in Portland and owns two homes in the state. He reportedly winters in Sarasota, Fla., which is what the governor was referring to. He is one of the most prominent living authors in the world, with a net worth of $400 million, according to celebritynetworth.com.